Ballina is one of the most scenic parkland courses in the West of Ireland. Designed by the late great Eddie Hackett, measuring 6,103 yards is a par-71 with a standard scratch of 69. The present course was part of the former Jones Estate at Musgrove, with evocative landmarks as "The Larch Woods" and "The Rookery" recalling the days before the acquisition of the lands in 1924.Set in rolling parklands, on the outskirts of the town, with a backdrop of the Ox Mountains and the Majestic dome of Nephin. Your game of golf at Ballina will encounter panoramic views of the rolling countryside gorse clad hills and wooded acres. Eddie Hackett had the following to say about the course "Ballina has created an interesting, testing and fair golf course. The eighteen hole course is in an ideal setting offering the golfer variety, challenge, interest and above all, enjoyable golf. 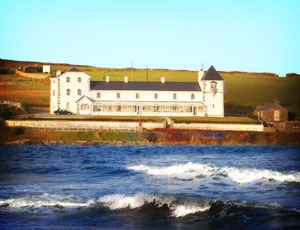 "Ballina has a fine clubhouse and the visitor is assured of the warmest of West of Ireland welcomes that is extended to all.Societies are welcome and group rates are available. The Irish Golfers Guide, 1911, describes Ballina Golf Club as "A nine-hole course, situated within ten minutes walk of Ballina Station". Its first President was John Garvey, Downhill, Ballina. The Captain was H. Scroope and the Hon. Secretary was John Flanagan. The Great War caused the club to close in 1914, but re-opened shortly after the war. It was marked out by Chas. H. Wilkinson, of Malahide, and was 2,185 yards long. Ballina Golf Club were runners-up in the Jack O’Sullivan Trophy on Sunday 9th September 2006, when they beaten by Ballinasloe Golf Club by 6 and halve matches to 3 and halve matches. The first leg was played was played at Ballinasloe on Sunday 2nd September when Dermot Dunican with Frank Donohue beat Paul Moran with Thomas Forde by 7 and 5. They were followed by Alan McGuire with Mark Conneely who beat Paul McLoughlin and Paul Judge by 3 and 2. Next up were Shane Kelly with Brendan Naughton who had a very convincing win over Michael McLoughlin with Brendan Lawrence by 7 and 6. The final match of Kevin Cunniffe with Brian Conneely went all the way to the 22nd-hole before the Mayo men clamed the point. The second leg was played at Ballina on Saturday 9th September, when Dermot Dunican with Frank Donohue secured the first point for the Galway club on the 20th-hole, when they beat the pair of Pat Howley with Brendan Lawrence. Next up was Brendan Naughton with Tony Broderick who lost to Paul Moran with Thomas Forde by a single-hole. They were followed by Alan McGuire and Mark Conneely who lost out to Michael McLoughlin with Padraig Moran who again lost by the single-hole. The final match of Kevin Cunniffe with Brian Conneely beat John Doherty with Denis Forde by 3 and 2, this resulted in the match between Kevin Roche and Enda Finn against Paul McLoughlin with Robert McGinty being called in. Michael Durcan won the Mayo Crystal Young Golfer of the Year Award with a total of 115.5 points followed by Tommy McGowan from neighbouring Strandhill on 81 points. Ballina won the Cecil Ewing Shield Final in 2006 when they beat Gort Golf Club in the Final by 7 matches to 3 matches. The first leg was played away at Gort Golf Club on 16th September with the second leg played at home on 30th September. Denis Bourke with Aidan Sweeney lost to Ronnie Killeen with Kieran Cullinane by 3 and 2. They were followed by Keith Cunningham with Dermot Timlin against Gerry Finn with John Forde who won their match by 2 and 1. Next up were Kieran O’Rourke with John Irwin who lost out to George Fahy with David Burke by a single hole. Eddie Keigher with Padraig Glancy beat Tom Barry with Finbar Gantly Snr. By 4 and 3. The final match of Padraig Naughton with Ollie Bolton against Tom Finneran with Alan Hynes was decided by a single hole in favour of the Galway men. The Second Leg took place at home on Saturday 30th September where local knowledge came to the fore. First up were Padraig Naughton with Ollie Bolton against Gerry Finn with John Forde who had a comfortable 4 and 3 win. They were followed by Kieran O’Rourke with John Irwin against George Fahy with David Burke who recorded a 3 and 2 win for the home side. Next up were Denis Bourke with Aidan Sweeney against Tom Finneran with Alan Hynes, this match was called in and a halve declared. Kieran Cunningham with Dermot Timlin had a very convincing victory over Ronnie Killeen with Kieran Cullinane by a 7 and 6 margin. This resulted in the final match between Eddie Keigher with Padraig Glancy against Tom Barry with Finbar Gantly Snr. being called in and a halve being recorded. Ballina Golf Club won the All-Ireland Junior Foursomes in 1989, when the team was Richard Doherty, Joseph Corcoran, Sean Hefferan, Paul Howley, they were captained by John Doherty and selected by Noel Dee. They won the All-Ireland Irish Mixed Foursomes in 1975, when the team was T. McLoughlin, J. Corcoran, L. Mitchell, S. Egan, N. McLoughlin, P. Rowe, M. Rowe, M. Jennings, D. Kelly and they were captained by M. Walsh. They won the Connaught Shield in 1960, when the team was, M. Ruddy, P. Crean, T. Walshe, J. Jennings, J. Quigley, S. Coyne, B. Moylett, F. Mannion, P. Granahan, P. J. McGolderick and they were captained by M. Murphy. They won it again in 1962, when the team was J. Jennings, A. Walshe, M. Ruddy, B. Moylett, P. J. McGolderick, D. Lambe, S. Coyne, J. Quigley, S. Doyle, P. Granahan and F. Mannion. They were Finalists in the Hibernian Cecil Ewing Shield in 1996 and runners-up in the Jack O'Sullivan Cup the same year. The Ladies of Ballina Golf Club were British and Irish Champions in the Daly Mail Foursomes in 1988, when the team was Rene Corcoran and Doherty. They won the Connaught Intermediate Team Event in 1986, when the team was Rene Corcoran, Mary Gallagher, Adrienna Stewart, Mary O'Sullivan and Jean Rodgers. They won the County Cup in 1996, when the team was Christine Dee, Ann Marie Hughes, Siobhan Hughes, Mary Armb, Kathleen Connor, Maureen Connolly, Margaret Clarke and Mary Browne. They also won it in 1992, when the team was G. Rodgers, B. Gallagher, M. Clarke, E. Loftus, A. Stewart, R. Corcoran and M. Doherty. They won the County Cup in 1991, when the team was J. Flynn, A. Stewart, E. Foody, M. Doherty, P. Rowley and I. McGrath. the I. L. G. U. Western District Team Event in 1984, the Huzzar Ladies Foursomes in 1988, the team was Dorothy McKena, Adrienne Stewart, Mary Lawrence and Mary Doherty. They won the Connaught Trophy in 1980, when the team was D. Kelly, M. Flanagan, M. Jennings, M. Walsh and F. Donoghue. Ballina Golf Club won the Ladies County Cup, in 1999. J. Corcoran, represented Connaught from 1974 to 1984, and played 23 matches. S. Heffernan played Connaught Youths from 1990 to 1991.